I remember the day like it was yesterday. Actually, it was two months ago. The day after this year’s Decatur Book Festival. I was driving north on I-75, following Shelley from Atlanta back to Chattanooga. This cool music filled the air on the Sunday mid-morning NPR station. It sounded like a band influenced by The Grateful Dead with the aloof lead solo licks, the reverb, the very title of the song, “Easy Plateau.” Who was it? The DJ said, Ryan Adams. From his Cold Roses CD. 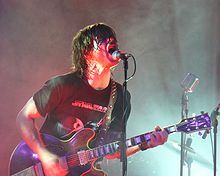 Ryan Adams? A friend had shared with me his whole Ryan Adams discography, but I’d never really given him a chance, and had always associated him with Brian Adams. I vaguely knew they weren’t the same artists. I never really liked “Cuts Like a Knife” by Brian Adams in the late 80s, or whenever that song was overplayed. Killer voice: His voice is pure. That’s what I think when I hear it. I don’t know anything about describing a voice, but he definitely has vocal range, strength, and interprets his songs. He can bellow it out, but he steps lightly and has a lot of different approaches to song, some delicate, some wistful. Always clear. For all that charisma, he often hides his eyes beneath long brown bangs. To me, the hidden eyes thing suggests he’s insecure but paradoxically at the same time demonstrates the confidence he has to execute these marvelous stories and compel a huge audience’s attention. That takes guts, even if he also seems insecure. Great songwriting: All the way around. Everyone starts with lyrics when they mean “songwriting.” I wouldn’t say it’s his forte, but I wouldn’t call it a deficit either. Sometimes they’re killer. Sometimes they’re pretty good. Sometimes they may be a tad cliche-sounding. However, it’s his overall skill, the way the songs are constructed, produced, everything. It’s one thing to appreciate wide ranges of music. It’s completely different in being able to pull that off as a creative artist. Adaptive: Chameleon might be a good word for it, but would you want to be compared to a lizard–albeit a colorful one–just because you were multi-talented? Well, yeah! Come to think of it, I wouldn’t mind that at all, especially in light of all this recent talk about “Niche-ing” yourself. It’s cool to see someone integrate their overall musical persona, to manage to be prolific even amongst what sounds like a lot of stress and occasional breakdowns. “Come Pick Me Up” just slays me. Especially when I’m feeling down and maybe it’s late at night and I’ve had a beer or two. Please don’t tell me how old he was when he wrote this.